Home / SLOThrowers Disc Golf Events / First Laguna Weekly With The New Tags (Renewal Event)! Drew Takes It Down!!! 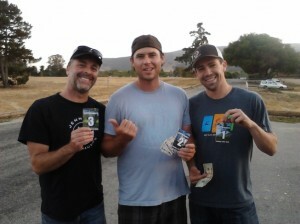 First Weekly Renewal Event of 2012… Odd-Man Singles at Laguna Lake Disc Golf Course. New Tags #1 – #9 were issued!!! Tag #3:Mark, Tag#7:Shaun, Tag#10:Jay, Tag#14:Drew and Tag#30:Brian. Still plenty of old tags out there… #30 was a Top 5, so be sure to bring yours out!